Morning guys! Yeah, sorry for the inactivity over the last couple of days, but I’ve been busy with my house, and going to events. Sorry I don’t have the time or will to divulge, but if you want to know more, search for the hash-tag #NECYouthDay . Trust me, it went in. Anyway, today’s post deals with a common problem that seems to be happening with Apple these days. Fraud. I’ve been a victim of this happening twice, myself, so I know how it feels. Thing is, bot my cases had different cards, which was strange. Each lump transaction was around £300-£500, which was…well…a real dent. It seems that Apple seem to be letting too many of these cases slip, and more often, the consumer gets the worst of it. If you’re lucky, like me, you’ll get the money refunded, and a new card. Problem is, this can only happen so many times before the bank decides that you’re on your own. I happen to have no chances left. Another thing is that immediately after notifying Apple, your Apple ID gets permanently disabled. Harsh, huh? You can’t get your stuff off iCloud, and you’ve gotta re-purchase those apps on a different account, seeing as you can’t even update the ones you have. Rant over, here’s the post! Jian Huang, head of Hoolai Game in Beijing. 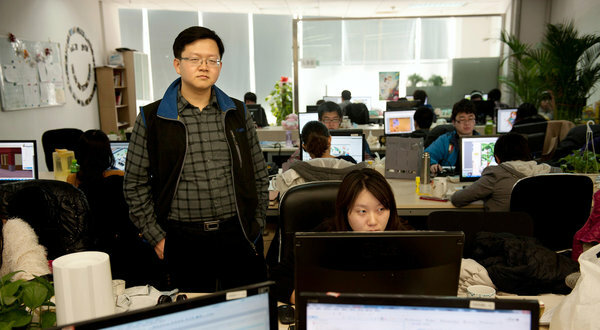 Hoolai, a game developer, discovered that it was missing payments from Apple. In a little over an hour, Ryan Matthew Pierson racked up $437.71 in iTunes charges for virtual currency that he could use to buy guns, nightclubs and cars in iMobsters, a popular iPhone game. One problem: Mr. Pierson, a technology writer in Texas, has never played iMobsters. Mr. Pierson raised the issue with Appleand his bank, and the problem was eventually resolved. But his experience is hardly unique, as reflected by hundreds of online complaints saying that Apple’s iTunes Store, and in particular its App Store, which the company portrays as the safest of shopping environments, is not so secure. The complaints come from consumers like Mr. Pierson, who say that their accounts have been hijacked or that some apps are falsely advertised. And they come from creators of apps, who say they are having to deal with fraudulent purchases that drain their time and resources. Software makers also complain that competition in the App Store has become so brutal that many companies resort to artificially inflating their popularity rankings to grab attention. It’s a change for Apple, which was once criticized for its micromanaging of the App Store. Now the problem is not too much control, but too little. The App Store offers more than 600,000 applications for iPhones, iPads and iPodTouches, and has already generated billions in revenue for Apple and its developers. That makes it both the best deal going for software makers and consumers, and also a hulking target for those looking to manipulate the system and cheat people. Apple declined a request for an interview, but said in a statement that it was working to enhance security. It advised customers whose payment information had been stolen to change their iTunes passwords and to contact their financial institutions.